After my strike out at Richie’s Koffee Shop, I needed to find a new spot for dinner. I still didn’t really know where to go so I kept driving down State Street. There were a couple of options that peaked my interest, including a pizza for the third night in a row, but in the end, it was BBQ that sucked me in. As per usual, I tried to get online and find a menu. I could find a lot of great reviews on several different sites, but no menu or website. The closest thing I could find was a Facebook page, but they didn’t have a menu that was easily findable either. I decided the hell with it. All the pictures and all the reviews of the place looked great. I had the time. I might as well go inside, sit down, and actually have a real lunch break. I stepped inside the restaurant just before 5:00 on a Wednesday night. There were a couple people sitting at the incredibly awesome bar that takes up a good chunk of the front of the house and there were a couple more people sitting at the tables in the small dining room. Seeing as I was alone, I sat down at the bar and asked for a Coke and menu. 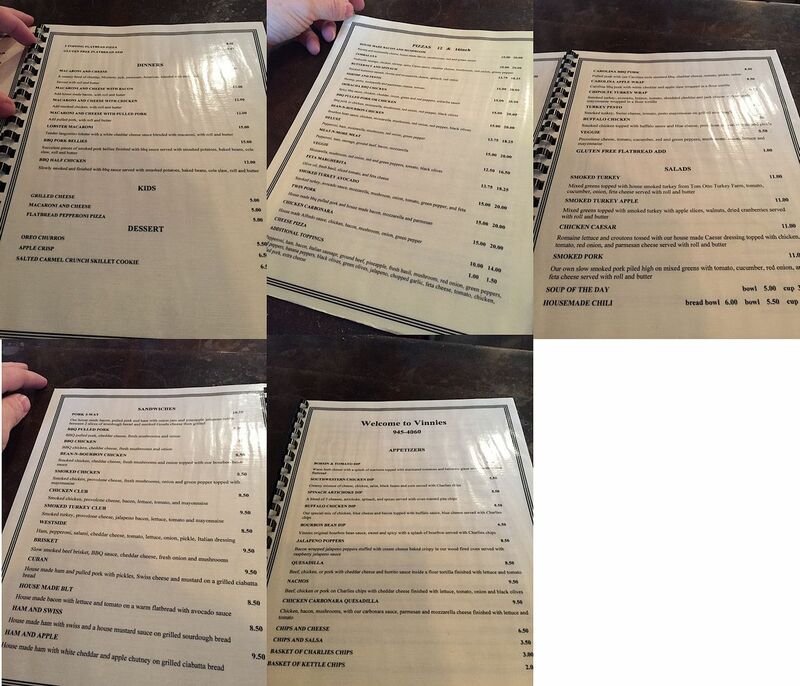 The menu was quite large for such a small place. The big ticket items are the woodfired pizzas and the house smoked BBQ. I was leaning towards the brisket sandwich but on the last page and found something much more interesting. I ordered the Macaroni and Cheese with Pulled Pork. It’s hard for me even to start with this dish. It was pretty damn awesome. 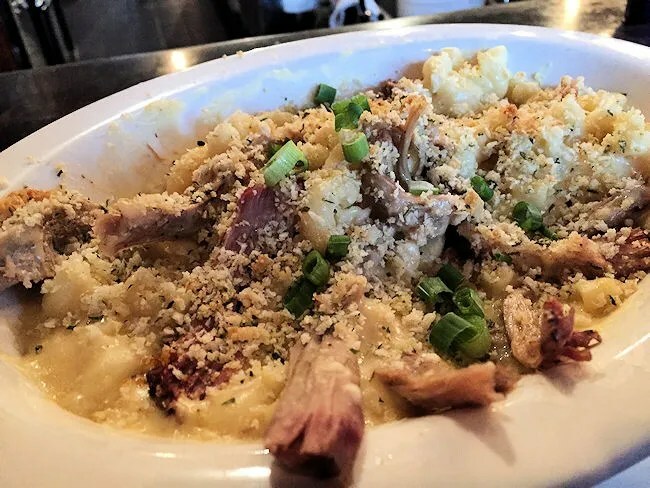 The large bowl of macaroni noodles is mixed with a cheese sauce consisting of cheddar, Monteey jack, Parmesan, and American cheese topped with scallions and bread crumbs which gave it an amazing crispy crunch. Mixed in with the noodles were large pieces of the house smoked pulled pork. It’s hard to describe just how good this dish was. The Macaroni and Cheese on it’s own was outstanding. It’s so creamy and very rich. The addition of the pulled pork just made a great thing even greater. The meat was smoky, tender, and covered in the rich, creamy cheese sauce. 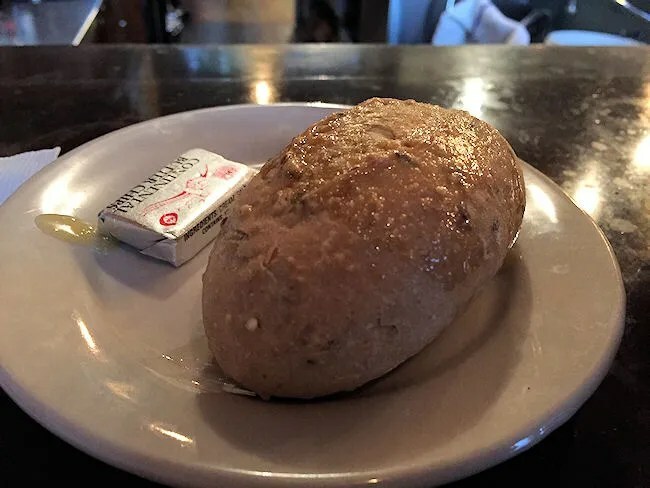 The entrée portion of the pasta dish came with a roll and butter. My bill was a little over $14 before tip. Honestly, as much as I wanted a burger from Richie’s Koffee Shop, I’m actually kind of glad they screwed up. 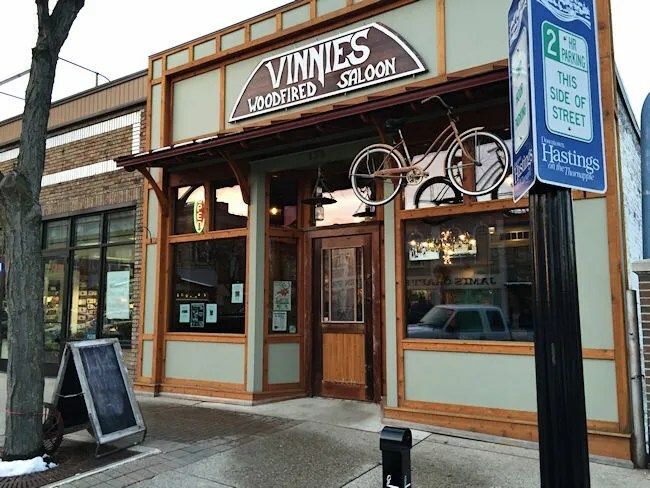 I wasn’t going to stop in to Vinnie’s because I couldn’t find a menu online and damn, that would have been stupid (about as stupid as not having a website with a menu in 2015). The food was fantastic. Vinnie’s really is the best of what I like in restaurants. Great atmosphere. Great beer selection (I was on the clock, so no beer, but lots of Michigan craft selections.) Great BBQ. Great pizza. 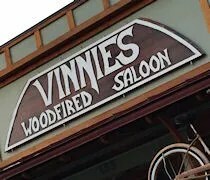 Hastings is incredibly lucky to a place like Vinnie’s Woodfired Saloon. I hope I get sent back that way sometime soon. Too bad it’s been run into the ground by a an out of state con artist who calls himself “DUKE” who fired all the local help just to boost his own ego that he’s some kind of big shot business owner. This place sits nearly empty daily cause of the poor energy and unappealing ownership that has pushed the home town feel and great help right out the front door. If this place is open another 6 months it’ll be a miracle.